28 April 2009--The situation continues to evolve rapidly. 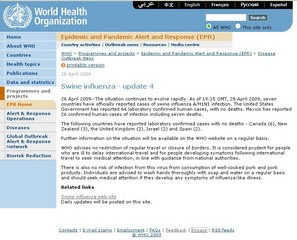 As of 19:15 GMT, 28 April 2009, seven countries have officially reported cases of swine influenza A/H1N1 infection. The United States Government has reported 64 laboratory confirmed human cases, with no deaths. Mexico has reported 26 confirmed human cases of infection including seven deaths. The following countries have reported laboratory confirmed cases with no deaths - Canada (6), New Zealand (3), the United Kingdom (2), Israel (2) and Spain (2).